Ads are annoying. Visitors don't like them and publishers don't really like them either. But something has to pay the bills, doesn't it? There was a time when we all hoped some sort of micropayment system might work, but nobody has been able to do that yet (though Google is trying again, see Contributor by Google). 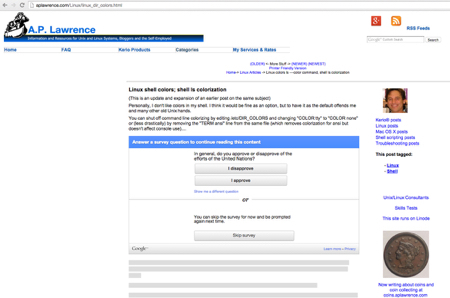 For some websites, Googles Google Consumer Surveys might be a replacement. This hides part of your page and asks the visitor to answer a survey question to see the hidden text. They have an option to answer more questions to get a weeks worth of site access. Note that this isn't necessarily a privacy invasion as Google has no idea who you are unless you are signed into a Google account. Surveys are not contextually targeted in any case. Obviously this would work best on pages that solve problems or contain important information. You wouldn't implement these on a page like this. I have added surveys to a handful of pages to see if they will work. You can see one at Lost Linux Password if you like. I would love to kill all the ads here. I'd like to see other sites use this too, though I suppose if everyone did it the payout to publishers would probably drop. But everyone cannot do it, because you really need a particular type of article for this to work. We'll see what happens. Google has me in "test" mode right now and if there is not sufficient engagement they'll suspend my account. That's a real possibility as visitors do have the option to see the hidden content simply by skipping the content. -> Surveys instead of ads? It did not work for me. Google wants a 10% completion rate; they didn't tell me what I got, but I'm sure it was far below that.